I have created a fanpage for TutFreak – Do join in there. It’s a very easy process to create one. To create a Google + Fan Page you must start by going to https://plus.google.com/pages/create where you will be able to choose from the following categories. After selecting the category for your fan page, you will be prompted to enter your Page name, Website (optional), select a category, and who you would like to be able to see your fan page. You can now limit what age group can see your fan page and limit if the content is not appropriate for certain age groups or users (18+, 21+ and visible to all). After filling out this information Google will create your page. Next you will be prompted to choose a Tagline for your business. In the Tagline section you will have 10 words to describe your page the best. On this page you will also be able to add a profile photo to your Google + Fan Page. 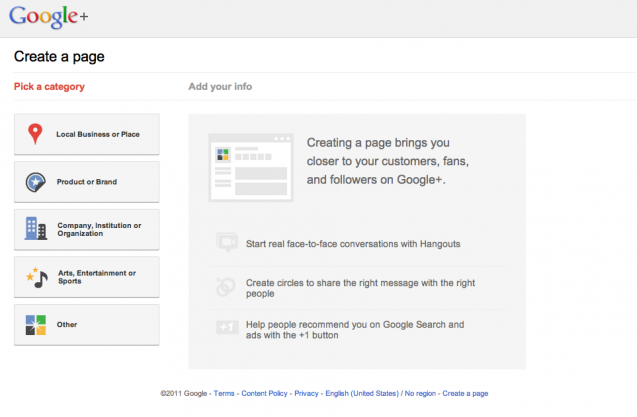 Right now, Google has allowed to setup Google + Fan Pages and not allowed them to customize it like FB. They also haven’t given anyone the ability to customize the URL or give your Business a username like http://www.plus.google.com/businessname They haven’t announced if or when this will become available but I would imagine it will happen soon. PS – check out the profile image uploader/editor, it has lots of editing options.